(UK Telegraph) – His nickname is ‘Money’ and for good reason. 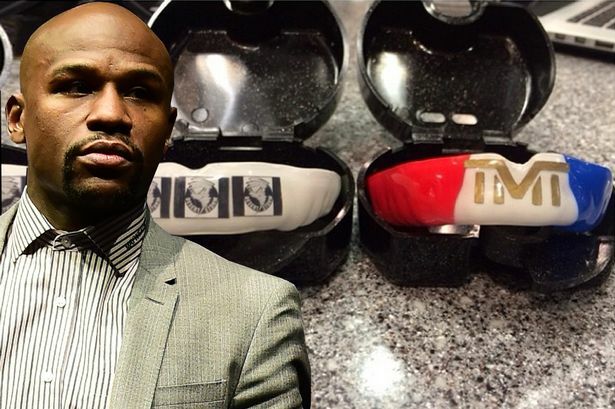 Ahead of his bout against Manny Pacquiao, Floyd Mayweather Jr is set to splash the cash on a mouthguard worth up to $25,000. According to TMZ, Mayweather gets his mouthpieces custom made by Lee Gause, a dentist based in New York, who often flies to Los Angeles to ensure his work meets his client’s needs. The world’s richest athlete is not sparing any expense on his preparations or equipment. Floyd Mayweather Jnr has revealed that the 25,000 US dollar mouthguard contains diamonds, gold and genuine $100 bills and will be used in his fight against Manny Pacquiao on May 3rd. Mayweather also has a celebrated female chef who is being paid 1,000 US dollars for each meal she prepares in camp.